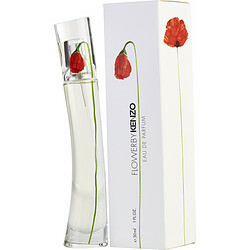 Kenzo Flower by Kenzo is a modern fragrance that is perfect for the casual woman. Its intriguing scent features hints of sweet spices and soft, orange flowers, providing women with a perfume that can be used for a number of situations. Since its introduction in 2000, Kenzo Flower has been the perfume of choice for the woman who wants something subtle and unique. No matter where this fragrance is worn, it is sure to turn heads and bring attention to you. Kenzo Flower smells of talcum powder, and not flowery at all (on me). Please sample before buying if you are looking for something floral, because it may not smell floral on you. Kenzo Flower eau de parfum I purchase this for my wife just as I was leaving for Iraq in 2004 and I was taking a chance on this purchase because she is very particular when it comes to parfums , it was a hit out of the park and I have been purchasing it every since, she loves it, thanks for making me a hero more than just in defense of our country but as a husband also! !